The lieutenant governor will be in southwest Missouri’s Branson Friday morning to discuss jobs, veterans and retirees. Lieutenant Governor Mike Parson (R) will address the Branson Area Lake Chamber of Commerce Friday. 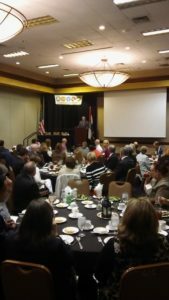 He tells Missourinet 80 percent of new jobs in Missouri come from existing businesses. “So a lot of times we spend a lot of time trying to think how do we recruit business into our state and I want to do that, but I also want everybody to remember the majority of them come from existing businesses,” says Parson. Parson emphasizes the importance of Main Street businesses. During his Branson Area Lake Chamber presentation, Parson will outline his efforts to get more retirees to move to the Show-Me State. Parson says about 10,000 Americans retire daily, and wants to get one percent of them to move to the Show-Me State. “Where to Retire” magazine has selected Branson as a top retirement spot. The Branson Chamber of Commerce says while the city’s population is about 10,000, eight million visitors travel there annually. Parson will also hold a Veterans town hall at 10:45 on Friday morning at the Branson Golden Corral, which is on Shepherd of the Hills Expressway. All veterans and their families are welcome. Parson says there are a record number of veterans and seniors in Branson. Tourism is Missouri’s second-largest industry, behind agriculture. The Branson Chamber says many retirees find jobs in the town’s entertainment attractions and theaters. As Lieutenant Governor, Parson is also chair of the veterans benefits awareness task force and vice chair of the Missouri Tourism Commission. Parson is also the “elderly advocate” in Missouri, as Lt. Governor.